Like many beloved tales of early Americana, such as Betsy Ross creating the flag, the Declaration of Independence being signed on July 4th (it was actually about a month later), and Paul Revere doing that midnight ride as a solo act, the tale of the Liberty Bell ringing to mark the first reading of the Declaration of Independence may be more fantasy than fact. 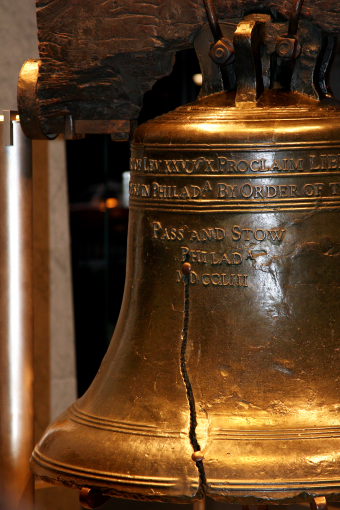 We know the bells in the city of Philadelphia were rung on July 8, 1776 to celebrate the occasion, but it’s unlikely that the Liberty Bell was among those pealing that day. The Liberty Bell came to be in 1751 when the Pennsylvania Provincial Assembly had it made to commemorate the fiftieth anniversary of the state’s constitution. The bell was cracked during a test and recast twice before being hung from the Pennsylvania State House steeple in 1753. The bell was rung to call to the assembly to order, and to summon people for special events and important announcements, such as the ascension of King George III. But after 1773, ringing the bell was avoided. The steeple it was enclosed in was in such disrepair it was feared it would topple over. A back-up bell to toll the hours was installed in a small belfry on the roof of the statehouse. It was this bell that most likely rang with all the others in Philadelphia after the reading of the Declaration of Independence on July 8. The Liberty Bell sat in the rotting steeple until 1781, when it was lowered into the brick portion of the tower, unseen for 71 years. It was finally put on display for public viewing in 1852. It was in the 1850s that the legend of the Liberty Bell being rung as the Declaration of Independence was being read began thanks to several writers. Two of the most noteworthy tales involve stories being told from the point of view of Revolutionary War veterans, and an elderly bell-ringer and a young lad. As often happens, fact and fiction begin to merge with the passing years. 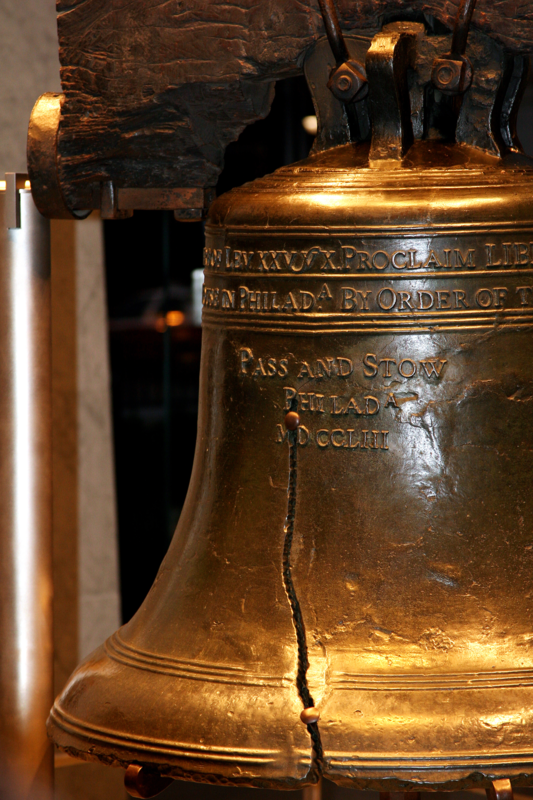 Did the Liberty Bell Ring at the Signing of the Declaration of Independence? At some point late in the 20th Century — and I believe that it was during the super-rebellious 1960s or the “silly ’70s” — a very unhealthy tendency overcame the U.S. broadcast media and academia … and it persists even now, decades later, because these two influential segments of society (media and academia) are almost completely controlled by a deeply troubled “wing” of the American people. The “unhealthy tendency” that I mentioned, just above, is a leaning toward REVISIONIST HISTORY and an supposed DEMYTHOLOGIZING of history. There is now, in the least reliable circles of people, a complete disbelief — or at least a skepticism — about what had been accepted as fact for 200 or 300 years (or even more). I believe that the intellectual “sickness” that I am describing and criticizing had its roots in the misguided thoughts of some religious scholars, in north-central Europe in the first half of the 20th Century, who suddenly began to claim that the Bible was not the inerrant word of God, but was filled with errors and fictions that needed to be “demythologized.” This spirit of a lack of trust in what had been believed for centuries and even millennia was, I believe, carried over into the field of history in the second half of the 20th Century. I reject and even condemn it.